Like most English teachers, teaching non-fiction text structures just doesn’t offer the same excitement as the flow of beautiful prose. However, with 44 states now using Common Core, the push for more informational texts is inevitable. When my school began to transition to Common Core, I knew that teaching informational texts was a weak point of mine, but I still didn’t want to sacrifice any of the novels or short stories I teach. A colleague mentioned Newsela.com, and after scoping it out I was hooked. Think of it as a student-friendly newspaper with articles that adapt for each individual student. When you sign into Newsela, you will see a home screen featuring major news stories and a header with different eight different news categories. 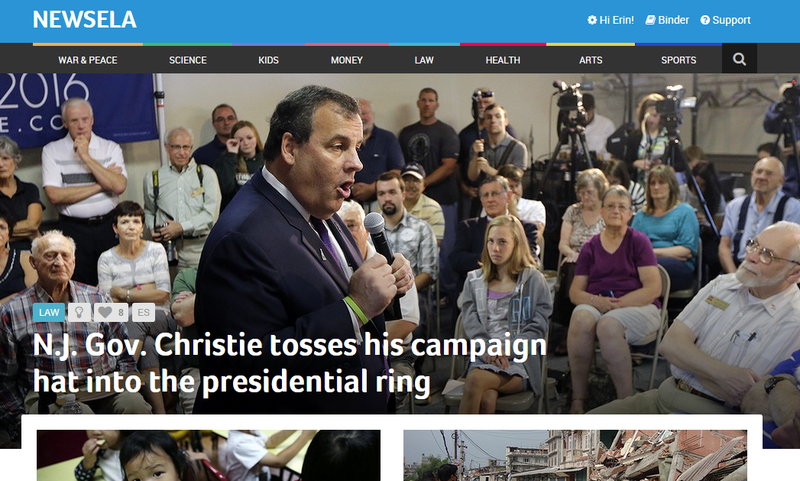 Newsela aggregates its stories from various other news sites, such as The Associated Press or Los Angeles Times. I love the selection of stories it choose; they are always topical and high-interest. What hooked me to Newsela was its ability to alter each story based on specific reading levels. When students click on a story, they are given the option to change the reading level by choosing a Lexile. While the content stays the same, the vocabulary and syntax of the article changes instantly to fit that given level. Take a look at the two articles below. While they offer the same content, one is written at an 8th grade reading level with an 1160 Lexile and 671 words. The other is at a 3rd grade reading level with a 610 Lexile and 356 words. Even the headline changes! There are a few other features about Newsela that I appreciate. 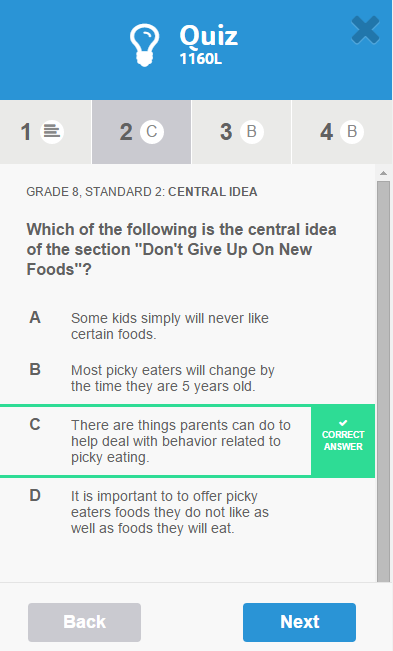 First, they offer short, 4-question multiple choice quizzes that are aligned to specific Common Core standards with many of their articles. Second, They have a streamlined search technique that makes it easy to find the perfect article for your lesson. Search by topic, keyword, standard addressed or grade-level. Third, they offer students the ability to “mark up the text” while they read, by highlighting key parts. I used to assign weekly Newsela articles, however I found that my students got burnt out. Now, I use it to add a supplemental non-fiction article or two to each unit that I teach. While Newsela recently added a “Pro” version that educators can pay for in order to get added features, including logging student progress and results, I have found success using the free version. Below is the step-by-step process I use when incorporating Newsela into my lessons. Consider key themes. Take Anne Frank, for example. I could use a specific idea such as “Holocaust” or an abstract theme like “Intolerance.” I use these as the keywords for my search. Sometimes I like to tell my students the keyword and let them choose an article – it helps give them ownership of the assignment and allows them to pick something they’re interested in! Start class with an open-ended journal entry to get students thinking about the topic. After a brief discussion, I’ll have them read the article. The Binder feature glitches for my students, so I just have them search for the headline. Students take the quiz, then record their results and chosen Lexile. I often have a second journal question that relates to their warm-up that students can work on if they finish early. Because I don’t pay for the Pro Version, I created my own graph for my students to use to chart their progress. For each article, students color in two bars: one for the Lexile they chose and one for the percentage they earned on the quiz. To download a free copy of the chart I created, click here. What do YOU think about Newsela?